How does such a bubble continue with so many people being aware of it? Did this happen during the other bubbles this early, and were so many people willing to irrationally and vehemently deny it? The greater fool theory. Even those aware of the silliness participate because they believe someone else is a true believer and will pay them an even more inflated price. Eventually, there is no one left who truly believes, and those betting on a greater fool coming around are left holding the bag. > were so many people willing to irrationally and vehemently deny it? Stare long and hard at that sharp climb before the equally sharp fall. It happens in every bubble. People ARE irrational, everyone. When people see other people “making” lots of money doing nothing they start to “feel” that maybe other people is right after all and he is wrong. Do you thing Newton was smart? He bought stock of the the “South Sea Company”, one of the first financial scams and sell at like 4 times what he had invested when he thought is was not going to rise more. I live in Spain, here home prices were rising >25% each year, in some places doubling it. I KNEW it was a classical bubble because I read economic books but as time went by and the prices went higher and higher and people started to say that “home prices never had went down on history”, and “prices never will go down as the German people will buy”, I saw people “buying”(getting a loan) for 60.000 and sell two years later for 150.000!!! without working at all. I started to believe that maybe I was wrong because I said: it has to go down and it went up again and again. Everybody left and right were telling me how good opportunities houses were. I started feeling outside of the groups as they did not liked what I had to say. They wanted to believe because everybody had bought houses(young people for their selfs and old people helping their offspring or investment. Hopefully there will be enough early warning like this to minimize the size of the bubble and keep things more in check. Bubbles will be around as long as there is greed. 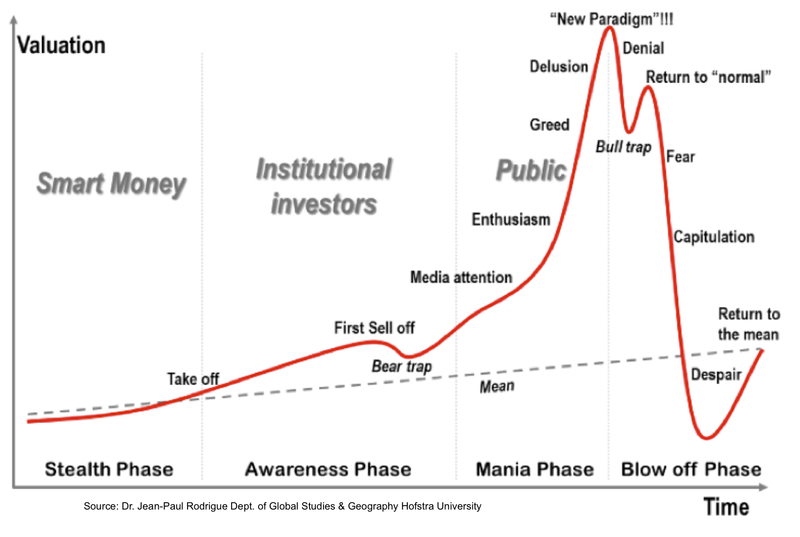 Even amongst those that recognize the bubble, the incentive is to stay in and keep dancing because the profits go exponential and they’re convinced that they can be the first out the door once the flames get out of control. Great post. I totally agree. Manias are good for venture returns…. That is as good a picture as any of the sequence of events, but the background image of ‘smart money, institutional investors, public’ is contrived. It is institutional investors, led by college endowments and public pensions, that fuel this insanity of greed. There is no ‘sell off’ bump as depicted. More importantly, the belief that 2+2=5 fuels both the government power structure and the privileges of the endowments. There is no such thing as ‘smart money,’ just as there is no such thing as a ‘smart bomb.’ Wisdom is in the hands of the person who holds it, or not. This is great for “silicon valley talent” at least for the next couple of years. And then it’ll be just like the dot.com bust, massive layoffs and stagnation. Pandora is a perfect example. It has a 3 billion dollar IPO and the company is losing money. A company that has never made money shouldn’t have a valuation that large. It just doesn’t make sense. The question that I’ve been wondering about is if we are in a tech bubble and the market crashes what will its side effects be? Is there something that someone could bet on (invest in) that would go up if the tech market crashes? If anyone has any stories from the previous bubble I’d be interested. It doesn’t feel like we’re there yet, as I default back to the mom rule. When your mom mentions the latest tech ipo, or when your mom talks about buying and flipping houses… then you know you’re in a bubble. Good article. this is also a bubble that will crash and burn but not before the mania peaks. Thank you for this article – the topic was also touched on by this morning’s “Today” programme on BBC Radio 4. As I was half-asleep at the time this post has proven helpful. I would guess that you are right about the current “phase” but I wouldn’t want to bet on the precise timing of it. What exactly is the graph of? When it says valuation… valuation of what? The whole industry? Certain shares? Is that line just made up to give the argument some legitimacy? We may indeed be in a bubble, but this is just an example of the sloppy analysis that gets you there. at last: someone who is writing about the web 2.0 bubble bursting that is totally inevitable! virtual reality is virtual, and not reality. amazon.com wasn’t profitable for a long, long time – and now it acts mostly as a database and post office. web 2.0 didn’t invent anything new: myspace became facebook – and google was merged into a global political agenda. i can’t believe that people who i went to college with are in california making FAVICONS and thinking that they are changing the world. Bubbles Occur Even with the knowledge of the bubble happening because of greed. The Big Banks can keep pushing money into a bubble until it just looks too good to not get a piece of it then once enough people buy in the big banks bail out and leave you with the losses. While it unfolds “by the book,” is the time between the “bear trap” and the “bull trap” getting shorter with each passing bubble? Kind of like when you boil water and the bubbles form and pop faster as the pot gains heat. Is PCLN not in this bubble formation at the moment (November 2011)?